How much time can you save with DAM software? How would you feel about saving more than 10 hours a week on your personal workload? Sounds too good to be true? 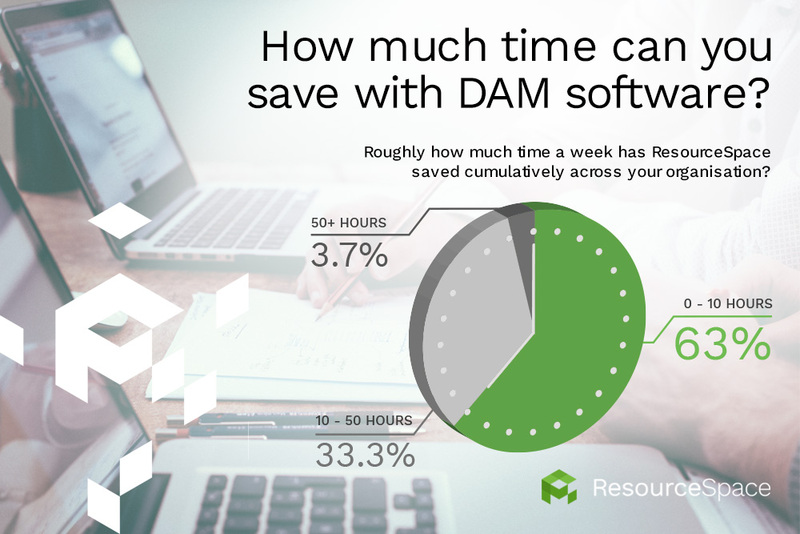 ResourceSpace recently surveyed its customers to find out just how much time users reclaim when using Digital Asset Management (DAM) software, and the results were surprising - a huge 81.5% of those asked stated that they save as many as 5 hours per week on their tasks, while 11% are enjoying over 10 hours of additional time in that period. And it's not just individuals that benefit - 63% of organisations told us they are cumulatively saving up to 10 hours per week, 33.3% between 10 and 50 hours per week and 3.7% saving over 50 hours a week, across their workforce. So we know that DAM works when it comes to saving time for your individual workers, and your organisation as whole - but how? ResourceSpace takes a look at the ways that DAM automation can help you to not only get things done, but to get things done quicker. Nobody wants to spend more time finding their files than they do creating them, yet so many of us waste large portions of our working schedule simply searching for items we've already put together and stored somewhere. Is it hiding in a complex file structure? Did somebody email it to you three weeks ago? Looking for the assets often means time spent browsing through folders and wading through shared drives, and can significantly eat into your time and productivity. With the advanced search functionality of DAM software, you'll be able to immediately locate the item that you need, as soon as you need it. A novel idea isn't it! Conquer the inbox of doom. Speaking of files that were emailed to you three weeks ago, using DAM software offers a faster and more convenient way to distribute files. You no longer have to spend time attaching items to email, or downloading bulky files you've received from colleagues - simply gather your digital content together in collections, and promptly share with those who need to access them, all by generating a URL. According to 77.8% of our customers, implementing DAM software has improved internal sharing capabilities, ensuring that you'll never get lost in a time-consuming email thread again (well, in regards to asset sharing - we can't perform miracles.). Cut down on content creation. When you're in a hurry, you don't always have time to build new content from scratch, and nor do you need to - it's pretty likely that you already have great material stored in your archives, ready to be repurposed and reshared. With DAM software, locating and browsing past work is simple, with relevant and useful items being rediscovered in no time, without unnecessary trawling. Making use of content you already have will save you many hours of labour in the areas of photography, graphic design, editing, copywriting and marketing. In fact, when polled, 55.6% of our customers agreed that DAM allows them to save time by utilising and recycling existing assets, rather than burning up time and resources every time they need content. We all know that the production of digital data and creative content is booming at an unprecedented rate. With such large volumes of material on our virtual hands, much of our working day can simply consist of processing and managing it. The administrative duties associated with digital assets can be dramatically reduced by using a DAM solution, shortening the amount of time that you spend allocating permissions, organising content and securing files. Busy being busy? Let ResourceSpace give you back the hours you need. We all know that time is money, which is why your organisation can always do with more of it. A professional DAM solution can give you additional hours in your working week to do what you do best - to find out how ResourceSpace can reset the clock for your levels of productivity, start your free trial of ResourceSpace today. To talk to the team further about saving time with DAM software, simply get in touch.